Here’s One Day In Prague With Sights, Food, and Drinks! So, you’re in Prague – hooray! 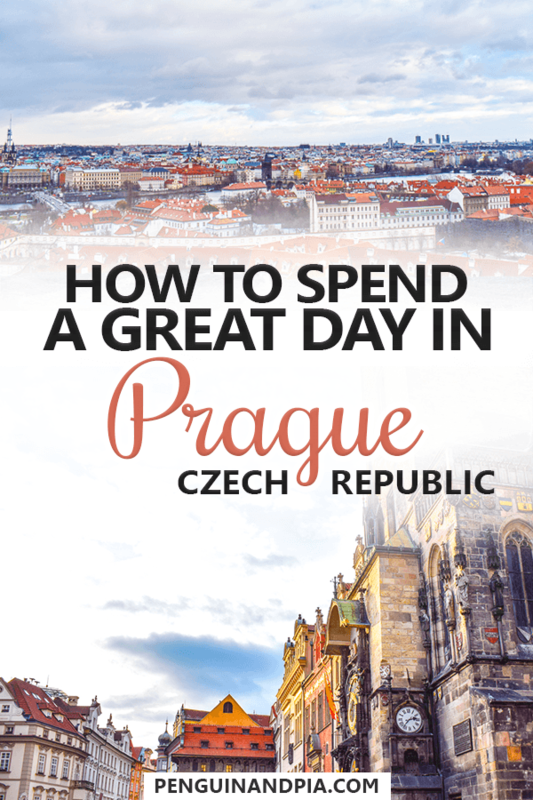 Maybe you’ve got a stopover flight or maybe you’ve got a bus connection, but this is a scenario where you only have one day in Prague! But is one day in Prague enough?! There are some must see places in Prague – and we’ll help you make the most of that day! Before we ever travelled to Prague, we also didn’t know what to do in Prague. What do you see on the first day? Where do you even begin?! Eric actually visited (and fell in love with) Prague on his classic Europe Trip. Years later, we travelled to Prague on our first trip together. That said, we had a few days to discover the city. 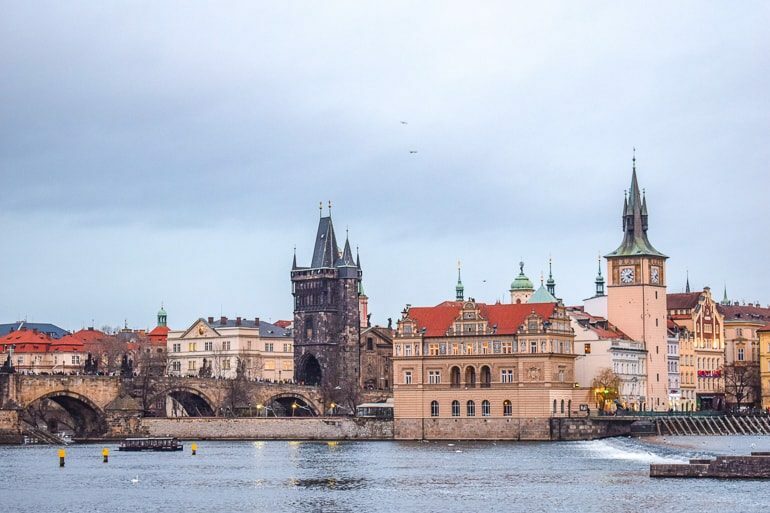 For this post, we’re going to make the perfect one day Prague itinerary – our version, at least. We know that it can be SO overwhelming trying to see Prague in a day – but it definitely is possible to see lots. 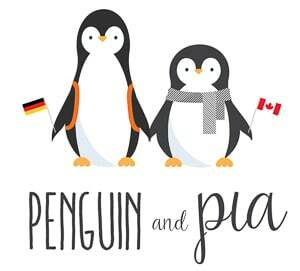 You don’t need Frommer’s or TripAdvisor when you’ve got Penguin and Pia! If you do end up staying the night, you can check here for accommodations in Prague. Check out AXA Hotel for a hotel and The RoadHouse for a great hostel (both in the city centre) close to all the best attractions. Just so you know, we plan to write a 2 day or longer itinerary very soon! Also, we really love Prague – so here are a few other posts to help you plan your Prague experience! 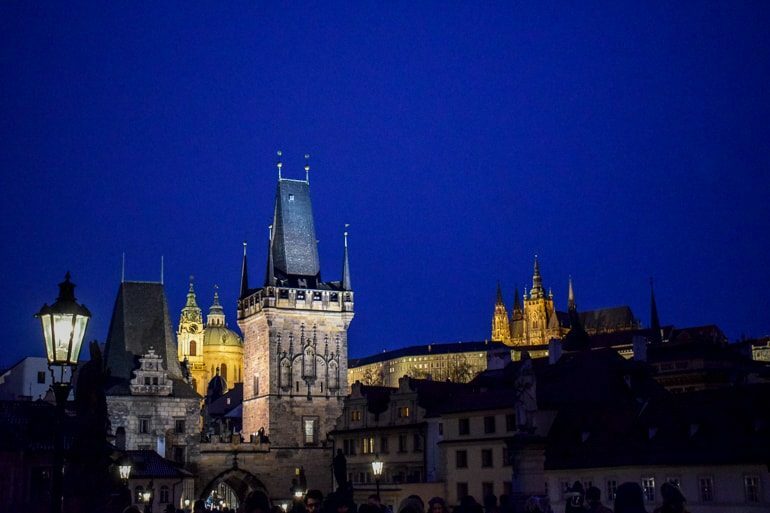 Time to wake up at the Charles Bridge – looks nice at night, too! If you want to really stretch the day out – you have to wake up early to catch the sunrise. Assuming you are already in Prague, one of the best places in the city to do this is the Charles Bridge. 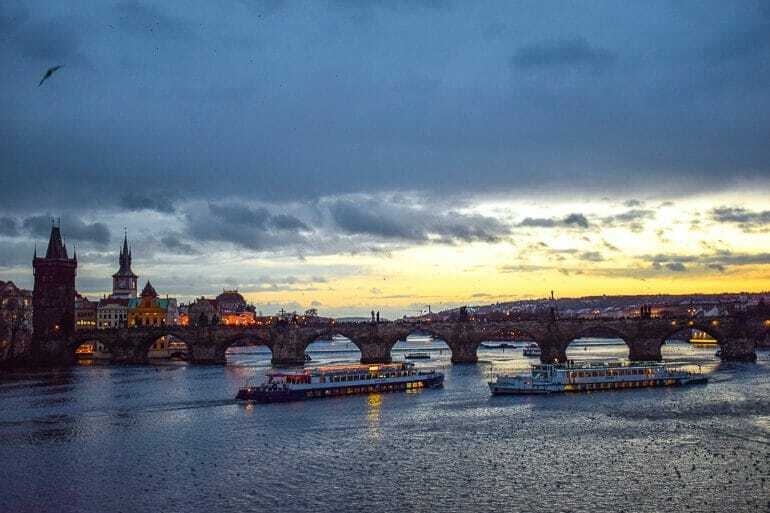 As one of the most famous bridges (there are many), this iconic spot overlooking the Vltava River is a really, really good one. In fact, you might bump into couples, young revelers from the night before, and photographers looking to catch a great shot. If you get up early enough, it will still be dark out – and honestly that isn’t a bad thing. The Castle will be lit up on the hillside to greet you. Prague is a gorgeous city at night… and it slowly comes alive with the morning light. Depending on where you stay, you might cross the Old Town, too, to get to the Charles Bridge. So, now it’s light out and you are hungry. Time for brunch – and you will need a decent one because you have a full day planned ahead! We gave you two options – Café Savoy or Bakeshop. They are slightly different different, so choose on based on your personal preference! Café Savoy is across the bridge on the other side of the river – away from the Old Town. This classy establishment does a really nice brunch menu and the place is also gorgeous. Keep in mind this is a sit down brunch so you’d spend a bit of time here to enjoy yourself and the food. If you know you want to go, it’s wise to make a reservation! Here is the website to check out the menu. From the Charles Bridge, Bakeshop is back towards the Old Town. You can head to Bakeshop if you aren’t looking for a fancy sit down brunch. Their style is more “grab and go”. You definitely CAN sit in to eat, but if you are short for time you can grab your bagel, freshly made item and coffee and hit the road into the Old Town! They have a great selection – here is the website to check out the menu. 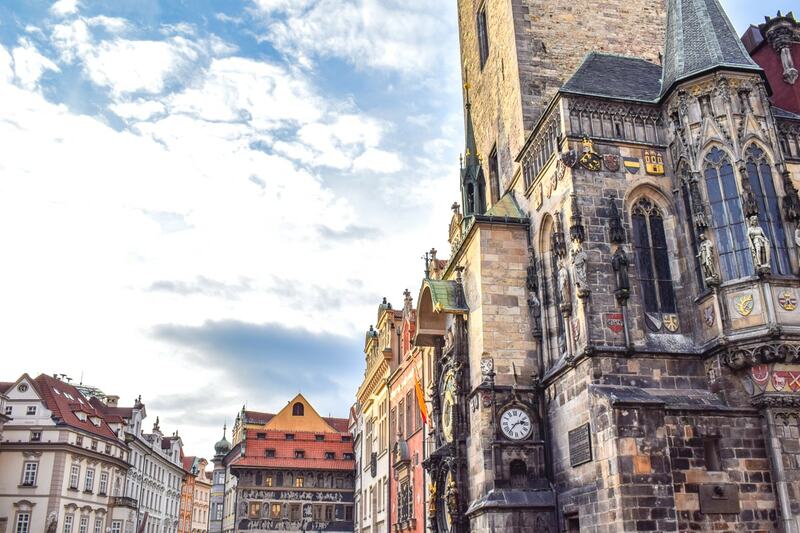 In the morning, you should explore the Old Town of Prague. Just so you know, the afternoon will have you explore Prague Castle and the other side of the river from the Old Town (called Malá Strana). So, don’t think we have missed the Castle with this one day itinerary! Basically, there is SO much to see in the Old Town (Staré Město) that you will need a whole morning to check it out. We think the best way to see it all is to walk. The thing about Prague is that it’s a walking city – since the streets are narrow and cobblestone. Buses don’t really navigate within the Old Town well. If you have mobility issues, there is public transportation (trams and subway) that can get you around. That said, the Old Town is basically all walkable. The Old Town Square – with the Astrological Clock, Church of Our Lady before Týn, etc. Try a “Trdelnik” or chimney cake fresh off the fire! If Winter: Prague Christmas Markets in the Old Town – we loved Prague in the winter! Now, if that sounds like a lot, that’s because it is! The best thing to do is grab a map and go exploring. If you want to make sure you see the best attractions and learn about the rich history, then you might consider a Prague walking tour. Tour guides are such a valuable source of information and they can make the experience far richer. Eric did a walking tour back in the day and remembers some of the Prague history to this day. Here’s a walking tour of the Old Town that ALSO covers Prague Castle – so that would check off the afternoon for you! If you wanted to make sure you see all that here is in a very short amount of time (one day) you might consider a Best of Prague Bus, Walk, and Boat Tour. You’d basically cover the morning and afternoon on this itinerary and you can still use the suggestion here for where to eat! It’s lunch time – and you know what that means: time for another great choice for places to eat! Sticking close to the Old Town, you don’t have to walk far to get to Lokál or Sisters Bistro after you are done with your morning full of exploring. In fact, these places are literally down the street from one another! Lokál is a very classic sit down lunch place. You know what to expect when you go – an authentic Czech experience. Good beer served up fresh, hearty traditional dishes, you name it. It’s nothing fancy – and that’s why it’s such a hit! If you want to check out the menu, it’s here. Sisters Bistro is right down the street from Lokál. Here, you get to try another Czech classic – chlebíčky. These “open faced sandwiches” are more on the lighter side – but can definitely be eaten as more than a snack. Sisters has pretty limited seating inside but you can always take them to go. There are loads of different combinations for you to try! Here’s the website if you want to learn more. 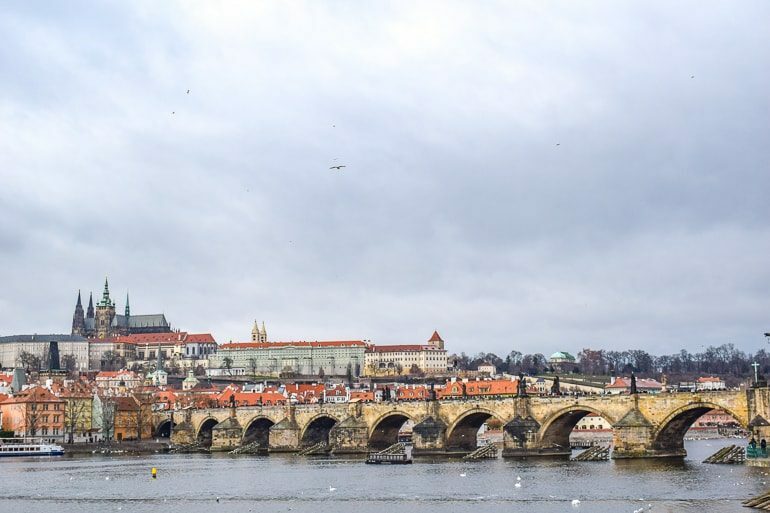 That side of the river is loaded with things to do and see – such as Prague Castle! Prague Castle – full of other smaller exhibits, St. Vitus Cathedral, etc. … you could also rent a Paddle Boat from Slovanský Ostrov island if it’s the summer! Now, if you were set on exploring the Castle (which would be a good option for a single day in Prague) then consider a tour ticket that gets you admission to buildings in the Prague Castle complex! This way, you get a guided tour, entrance admission to St. Vitus Cathedral, and more – all for one price and one booking. If not, you can just wander the Castle complex at your own leisure. The river on this side is full of interesting stops (many listed above), green spaces, and art installations by Czech artist David Černý – so go for a walk on this side and enjoy the Prague life. So you’ve explored more of Prague – seen the Castle, the Lennon Wall, maybe more! Time for another break. For this, head back into the Old Town since it’ll be easier to head to the evening activity you choose from there. We’ll once again suggest two different food/coffee spots: Café Imperial or Home Kitchen. Café Imperial is a famous and incredibly upscale place that is very popular – but for a reason. From good brunch to fresh cakes, it’s the perfect stop for a sweet treat or a small plate of something (if you are hungry). You can relax in the grandeur and have a coffee or tea and just generally get off your feet for a little bit! Here is the website if you want to check it out – it’s wise to make a reservation if you KNOW you want to pop in! Go to Home Kitchen for a more laid back feel than the option above. It’s a great place to relax. There are actually a few locations around the city – but the one at Kozi is the most central. Just a good place with a nice look and a no-fuzz menu full of good food, small eats, loads of beverages, and even breakfast (again, if you need more food at this point!). You can find their menu here. Well, your day is coming to a close – and the sun it coming down. You’ve had your coffee/beer/cake break – so you better plan out where you want to be to catch the sunset! For this, you have two options – both of which we have done and we loved. It’s either a hike the Memorial at Vitkov or a sunset boat cruise! 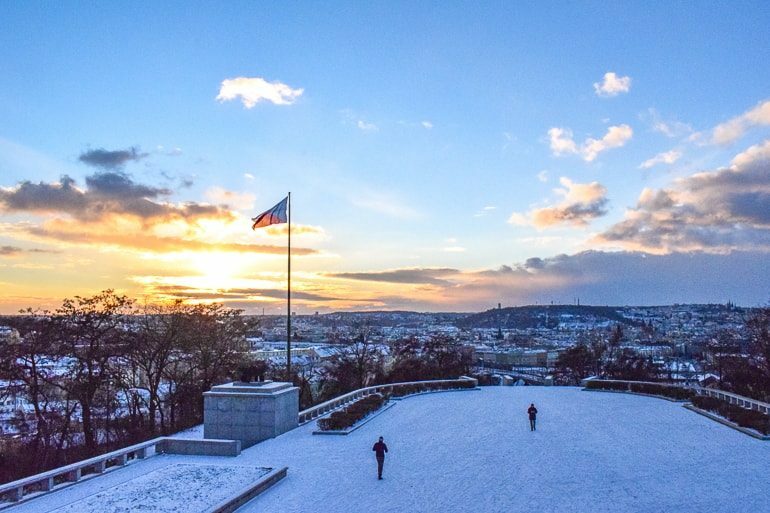 The sunset from Vitkov was absolutely stunning – even in winter! The first option has you going for a bit of a hike – but a little exercise is never a bad thing, right? Beyond the Old Town in Karlin (to the east of Florenc Bus Station) you’ll find a large hill called Vitkov in the Žižkov district. It’s here that you will find the National Monument. This statue is actually the third largest horse statue in the world and stands to remember Czech history. You can visit during the day when the museum is open to learn more about Czech history, if you like. Here’s the website for hours. But we brought you up here for the views. Looking out over Prague 1 and the river, we enjoyed a gorgeous sunset in the wintertime from up here. Just check the photo above! Those are the river boats you can hop on for the sunset! The other option is to head down to the river for a Vltava River Boat Cruise. If you’ve been walking the river and crossing bridges most of the day you may have noticed the numerous boats making their rounds. There are plenty of Vltava boat tours you can hop on – but we suggest a sunset cruise for great photos and an amazing sunset from the river. In fact, if you choose this option, you can even do a sunset dinner cruise with live music and then you can just have your dinner option on the boat. Either way, we suggest getting out on the water at least once – so maybe do this during the afternoon for a bit of a river tour OR even make a “party boat” your night activity when you want to go for drinks? There are loads of options here. It’s time for dinner in Prague – and you are in luck: there are SO many places to choose from! We have given you two – so it’s between Café Palanda or MAITREA. Café Palanda is this really, really good burger and fry place in the old town in Prague 1. There’s only a little burger sign hanging outside on the street so it’s easy to miss. We went there and we were NOT disappointed. With loads of different burger combinations and Czech beers to wash it all down, we would recommend Palanda for sure! You can check the menu here. Maitrea is a vegetarian option also located in the heart of the Old Town. It was recommended to us by our hosts in Prague but we didn’t get a chance to check it out. However, the menu is full of really good options – we’re big hummus fans. If you are feeling something lighter after a day of wandering, you can check their website for the menu here. 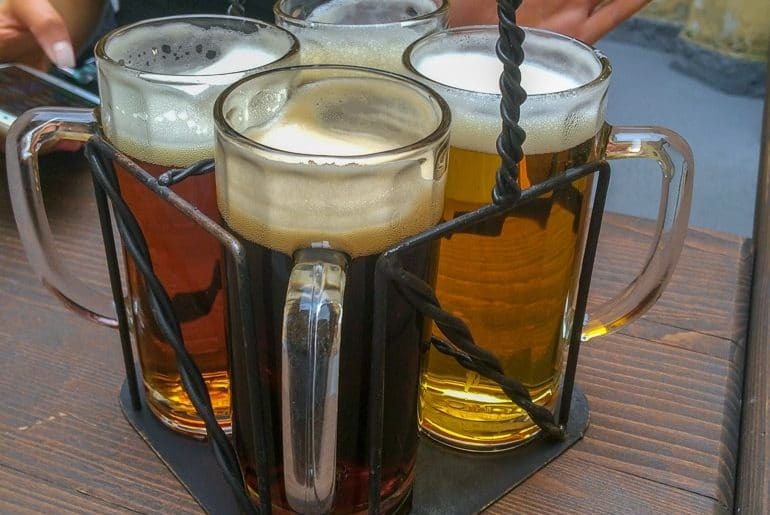 Go on – enjoy a beer (or four) in Prague! So, the night is upon you. You’re full from dinner and looking to end off the evening with a few beverages. How Czech of you! We’re got two options (as always) for you – Café Frida or Chapeau Rouge. Café Frida: Located out near the Memorial at Vitkov in Karlin, Café Frida is a small place with a more local feel. A friend of Eric’s brought us there since she was living in Prague and we really loved it! Inside, you get authentic Czech beers and a small menu that is really good if you are somehow still hungry. Go there to have a local, relaxed experience with good beer. Here is the website. Chapeau Rouge is a great place to head out for a bit more of a wild night. The place has something for everyone – with a bar area, a club area, and even a live music area all hidden inside. If you wan to enjoy some drinks, some dancing, and even live music to end off your perfect day in Prague, then Chapeau Rouge is for you. Check out the website for hours and events! And there you have it, our sample itinerary for one day in Prague! Honestly, there is SO much you could do over the course of a day in Prague. In fact, there’s enough to do to fill an entire week – easily. So, we hope that this shortened guide gives you some ideas and options for spending your day the way you want! Let us know what you liked and how your Prague visit goes!